Change your business model to get the patient data you need. Noah Data Mining: maybe you've heard of it, or maybe the practice management software you are using today doesn't fully integrate with Noah. But what Noah integration combined with Noah Data Mining can do for your practice or clinic is enable you to access all of your patient audiogram data, then examine it based on your search criteria, providing you with the data you need to make informed decisions. Working in an audiology practice, we'll assume that you have read hundreds if not thousands of audiograms. Scenario #1: After a patient receives a hearing test, and an audiogram is completed, your test reports are then available on a graphic chart for you to view via Noah. You can see results patient by patient, graph by graph. Your audiology practice may use Noah as a stand-alone system that your audiogram equipment is connected to. Your data stays there, or perhaps can be imported from Noah, but the reports are stagnant, meaning you can only view and print them. Scenario #2: Because of TIMS integration with Noah, you not only can see your data, you can mine your data. 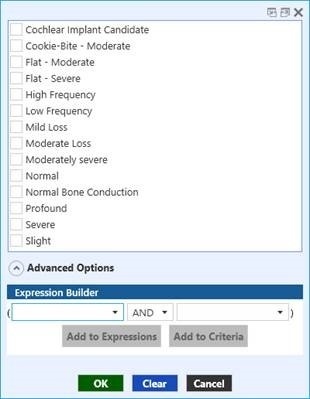 Analyze your audiograms and electronically compile a list based on criteria that you've pre-established. You can then filter your list by severity, configuration, and/or type of loss, by patient age, or by different clinic locations. You've just created a patient marketing list that matches up your patients' data. Filter your list by severity, configuration, and/or type of loss. Welcome to data research and to Noah Data Mining. If Noah is actually installed within your practice management software, the information that Noah captures is instantly available for you to use, all within one real-time software system. This gives you the ability to "mine" the Noah data... your data, at any time. TIMS Software automatically reads Noah, and stores all of your Noah data within the TIMS system. If you have a busy audiology practice and have been trying to figure out a better way to capture and analyze your patient audiogram data, we have your answer. Technology provides the data to help you with your busy audiology practice. Make certain you choose an audiology practice management software that provides you with all the tools and the data you need. With the integration that TIMS Software provides, Noah Data Mining becomes the translator of all of your important patient data making it an easily accessible and highly beneficial addition to your audiology practice. Don't miss next week's blog: Part 2, Mining Your Gold With Noah Data Mining. We'll take a more in-depth look into how Noah Data Mining works and what it can do for your practice.